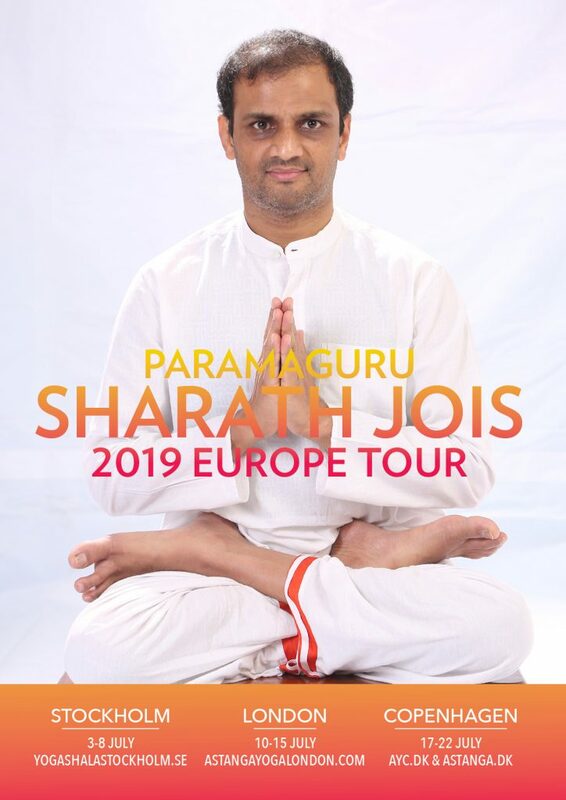 We are honoured and very happy to welcome Sharathji back to Copenhagen in July 2019. This is his 7th visit to Copenhagen and since 2009 he has blessed us and our city with his presence every second year. All yogis are welcome for classes of beginners, intermediate and experienced students as Sharathji every morning will lead us through the series in his energetic and calm manner. The workshop lasts 6 days with classes of led primary, 3 days of led intermediate and an afternoon conference. Paramaguru Sharath Jois is the master of Astanga yoga and director of the KPJ Ashtanga Yoga Institute of Mysore. He is the worlds most advanced practitioner of Astanga Yoga with regular practice of all 6 series being the only student of Guruji Sri. K. Pattabhi Jois who have been taught all series. R. Sharath Jois has been bestowed the title Paramaguru in Uttarkashi, India. In respect for his role as the lineage holder of the Astanga yoga tradition, guruparampara. Sharathji will give workshops in Stockholm and London the weeks before.